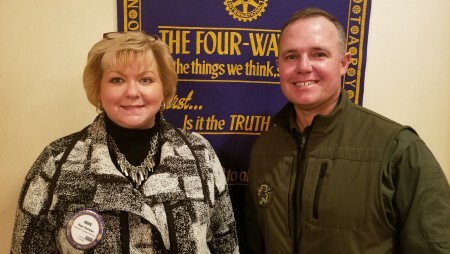 On Wednesday, Jan. 23, the Auburn Rotary Club hosted Chris Nix of the Alabama Department of Natural Resources, who spoke to Rotarians about the department’s efforts to monitor and mitigate the state’s alligator population. Pictured with Nix is Club President Hope Stockton. The Auburn Rotary Club meets each Wednesday from noon to 1 p.m. at Saugahatchee Country Club. For more information about the Auburn Rotary Club or how to become a member, visit www.auburnrotaryclub.com.